I'm so excited about Dina's new book, Love in Three-Quarter Time. 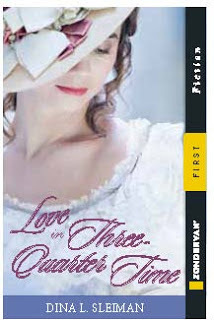 It's especially thrilling to know that, out of all the manuscripts and authors out there, Zondervan decided that Love in Three-Quarter Time and Dina Sleiman would be ideal to open their Zondervan First line. What is Zondervan First? It is Zondervan's lightning-fast new direct-to-digital publishing imprint. According to Zondervan, "Zondervan First will provide fresh and relevant content across all reading devices. Authors who publish under this model will have the same access to the Zondervan editorial and marketing teams as those published traditionally, which sets this program apart from other direct-to-digital publishers. "Zondervan First will initially focus on fiction but will eventually branch out to all the categories the company currently publishes. Submissions will be accepted for fiction, non-fiction and Bible material suitable for kids, teens and adults in addition to manuscripts geared for curriculum, church resources, academic and reference books. By publishing through the new imprint, authors will have the full backing of the Zondervan brand. "'As an industry leader, we developed Zondervan First to honor authors, agents and numerous consumers,' comments Steve Sammons, Executive Vice President for Consumer Engagement. 'Our editorial staff and sales, marketing and publicity force are uniquely respected, and Zondervan First authors will benefit from those existing talents, platforms and relationships.'" Opening a new line for a major publisher is an enormous responsibility for any book. It's also a huge pat on the back for any author. The publisher is, in effect, saying, "We are confident that this book is strong enough to give this whole line a successful start." Obviously, Love in Three-Quarter Time was just the book Zondervan was looking for. I contacted Sue Brower, Executive Editor at Zondervan, to find out why she chose Dina's story to open their line and what specifically made it a good fit. "The first thing that caught our attention about Dina’s new novel was the title—Love in Three-Quarter Time," she said. "It was so romantic and I just had to see what the book was about. Then when I started reading the story, I was compelled to keep going. It helps that I am a huge fan of this historical period and the characters drew me in. I wanted to know more about them and spend time with them. It’s been a lot of fun working with Dina on our first ebook original and hope the reader loves it too!" Congratulations on Love in Three-Quarter Time, Dina, and on this whole new venture. May it be just one of many successes! Oh, and isn't that an exceptionally lovely cover? DeAnna Julie Dodson has always been an avid reader and a lover of storytelling, whether on the page, the screen or the stage. This, along with her keen interest in history and her Christian faith, shows in her tales of love, forgiveness and triumph over adversity. She is the author of In Honor Bound, By Love Redeemed and To Grace Surrendered, a trilogy of medieval romances, as well as Letters in the Attic and The Key in the Attic, contemporary mysteries. 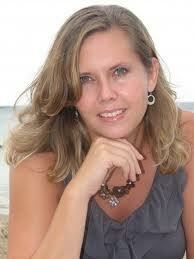 Her new series of Drew Farthering Mysteries will debut in the Summer of 2013 with Rules of Murder from Bethany House. A fifth-generation Texan, she makes her home north of Dallas with two spoiled cats. Thanks so much, DeAnna. I'm so blessed by this opportunity and by my Inky sisters. That was especially thoughtful of you to interview, Sue :) That really made my day. Sue was so excited about your story. And I think Z did a lovely job with the book. You know, it's really special to me that the title drew her, because that was the thing that came to me while praying about my next project and everything else sort of evolved from there. Dina, that stood out to me too, that story behind the story of how the title came to you via prayer and that was the thing that immediately snagged Sue's attention. Love the syncronicity of "God-things." I'm so excited about this line. It's a great opportunity for writers and probably one of the new ways publishers are meeting customer demand. I hope it does amazingly well!! I'm reading LITQT and just love it! I can see why Zondervan First chose Dina to be its first author. Thanks for the informative post, DeAnna. This line is of interest to authors and readers alike, because the publishing industry is definitely changing with the times. I like how this line is given the same editorial and marketing treatment as Zondervan's print books. And Dina, there's the possibility this will be published in traditional paperback format, is that correct? Yes, isn't this a cool way to get more high-quality stories to readers? I bet it's a big hit! Just downloaded my copy...hopefully will start reading it sometime this week. Excellent! Hope you enjoy it Elaine. Dina, I love that the title was what grabbed her first. And I think the fact that your book was chosen first shows you are going to be a star! A star? That would be lovely. For now, I'd just be happy to get the word out about this book. I don't know how anyone could resist that beautiful cover! I sooo agree about the title. So proud of "our Dina" being the first Zondervan first!